Some favorite easy Keto snacks! Hi friends! I tend to field a lot of questions from readers about what snacks to eat throughout the day. My general assumption is that most people are looking for stuff that will help sustain or boost their energy and can be made fairly quickly. So that’s the purpose of today’s post: Easy Keto Snacks. One of the benefits many report from adhering to a Keto lifestyle is feeling more satiated throughout the day. The probable reason for this is that when you’re not using carbs as your primary energy fuel, you’re theoretically less likely to experience that sugar rollercoaster effect, i.e. quick highs, fast lows. That being said, you may still want a snack here and there between meals. And I’m a big believer that when you’re hungry, you should listen to your body and EAT! Also, I don’t believe in ever depriving yourself so there’s that. When I’m coming up with easy Keto snacks, my primary goal is to put together something that has a decent amount of omega-3 fats in it, keep it whole foods based, and sneak in some extra vitamins and minerals. The secondary goal is to keep it simple. Bulletproof’s Pumpkin Collagen Bars: These are perfect for that grab-and-go sitch where you don’t even have 5 minutes to whip something up in the kitchen. I support (and enjoy!) pretty much all of Bulletproof’s products because they are so quality sourced. Also, Dave Asprey is the ultimate biohacker. You can purchase by clicking on the pic below or on the Bulletproof website. Bulletproof Collagen Protein Bars are a fav Keto snack! “Ants on a Log” Celery Boats : Throwin’ it back old school, but with a healthier twist. Slice up some celery, fill the inside with all natural, unsweetened peanut butter, and sprinkle a few dark cacao (chocolate) chips on top! I even go one step further and add a dash of pink himalayan salt and golden monkfruit sugar. Yum City! Rootz Superfood Chocolate Banana Nut Smoothie: I love, love, love Rootz Nutrition’s Superfood Protein, and I am a total supplement snob. 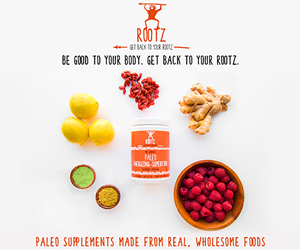 Rootz is Paleo and it contains nothing artificial, plus it is filled with oodles of vitamins and minerals! I also like that they use Hemp as their protein source so this is great for any vegetarians out there! As far as making a snack out of this, I blend up 1 serving/scoop of the Superfood Protein, 1 tablespoon of golden monkfruit sugar, 1 heaping tablespoon of all natural unsweetened peanut butter, 8 oz. of water, and a few ice cubes. “Everything-But-The-Bagel” Avocado: Avocados are often a staple in most Keto followers’ pantry. They are full of so much awesome Omega 3 fat! I try to eat one everyday. (What’s that saying about “keeps the Doctor away?” Oh wait, that was an apple. Same, kinda, whatever.) But eating them plain can get boring and eating healthy food should never feel like a chore. So I add a little bit of my favorite topping from Trader Joe’s, “Everything-But-The-Bagel” seasoning! It’s literally just that– bagel seasoning, sans bagel. To purchase this seasoning, click on the link below or head to your nearest Trader Joes! Macadamia Nuts: These are pretty self-explanatory. They’re nuts, duh. But one special note about them is that they contain a really high Omega 3 count, and often other types of nuts carry more Omega 6’s… which can be pretty inflammatory on the digestion system. These are great too because they’re so portable! You can purchase by clicking on link below or at your local grocer. My nickname wouldn’t be “Snacks” if I didn’t take the snacking biz seriously. I’m a big fan of planning ahead and preparing that at some point throughout my typically busy days, I’m going to need a lil somethin’ somethin’. If I don’t keep a few options like those listed above stocked in my kitchen, or even in my bag that I carry, chances are I’m going to have to reach for whatever’s available. That’s not the end of the world by any means, but I try to stay consistent with fueling my body with good nutrition, and having easy Keto snacks around certainly helps me in this regard! What are YOUR favorite healthy snacks? Fill a gal in!